If there is one problem I seem to never get rid of, it's my dry skin. While I seem to have my hydration down for my face, I can never seem to find the right solution for my body. I live in California where it is already so dry, but now that the Fall/Winter months are here and coming, my skin will just get dryer. I have always been on the hunt for the best skin care line that will do the trick, both high end and drug store. It wasn't until now that I have experienced a different, profound way of moisturizing my skin thanks to L'Occitane. L'Occitane's Shea Body Care line works perfectly tackle these rough, dry months. There is a total of 5 items that complete this line and cover all your dry skin needs. Shea Ultra Light Body Cream: Light and airy, this formula softens and leaves the skin feeling supple for 24 hours. Shea Ultra Rich Body Cream: Used for dry to very dry skin and formulated to soothe skin tightness for 48 hours. Shea Rich Body Lotion: With it's silky, satin feel, this lotion is great for dry skin and also used to soothe tightness for 48 hours. Shea Fabulous Oil: Softens and protects dry skin. Also absorbs quickly into the skin without a greasy after feel. Shea Fabulous Shower Oil: Gentle enough for all skin types, this shower oil is good for dry skin and helps with tightness and gives the skin a supple effect. Best used on wet skin and rinse off after. I never used to use any oils in my routine- especially not for my body- but incorporating an oil into my routine has helped my dry, tight skin tremendously. I start off by cleansing my body using the Shea Fabulous Shower Oil. I wet my skin first, apply this oil onto my wet skin and rinse. Since it is a thinner consistency, it absorbs into my skin better than my soap. Already I feel my skin is softer and not as thirsty. Depending on how dry my skin is, that's how I determine which cream or lotion I will use. For me, October is where the start of the dryness begins so I mix the Shea Fabulous Oil with the Shea Ultra Light Body Cream. Again, mixing the two helps both products absorb into my skin for better moisture and won't leave a greasy film or after feel. When my skin gets dryer and tighter in the later months, I will probably move on to mixing the Shea Fabulous Oil with either the Shea Ultra Rich Body Cream or the Shea Rich Body Lotion. 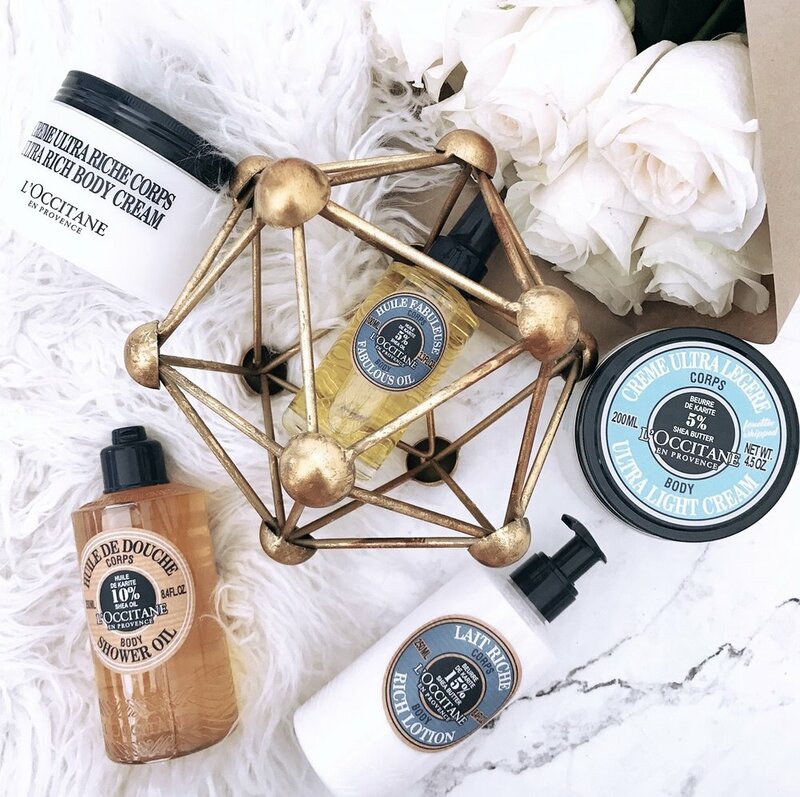 As for smell, all of these products have a very nice, light shea butter smell to them which won't interfere with any scents you add to your routine. Another bonus is that L'Occitane's Shea Butter is sourced Sustainable Fair Trade from female led collectives in Burka Faso. Burka Faso is one of the poorest countries in the world where 52% of the population consists of women. 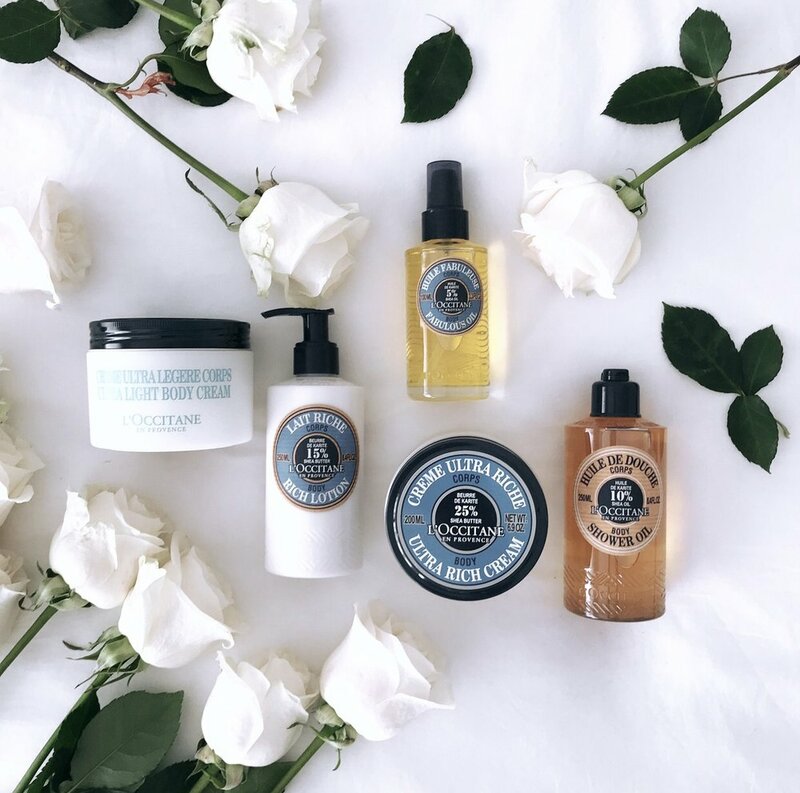 They produce shea butter by hand and all of L'Occitane's shea butter products are obtained through Fair Trade practices. Check out L'Occitane's Shea Butter line and other products HERE!